The 3G service launches in 16 metro areas: They’re claiming 400 to 700 Kbps on average, which is the same speed that Verizon Wireless estimates for its EVDO service. The service cost is roughly comparable to VZW and Sprint PCS: $100 for a PC Card with two-year commitment, unlimited usage of specific services for $60 to $80 per month. The $60/month rate applies to voice customers who commit to two years of HSDPA data; otherwise, it’s $80/month. Somebody left the door open over at Cingular, showing UMTS deployment: A customer-service portal has been left open, discovered by the folks at HowardForums, showing Cingular’s plans to announce UMTS service Nov. 1, 2005. UMTS is a catchall term for 3G cellular data, and the HSDPA (high-speed downlink packet access) flavor that’s faster than the first-generation plain UMTS and CDMA-based EVDO is considered UMTS. Our fine colleague Nancy Gohring got ahold of this story and Cingular commented on the Web site: no comment! But they said they’re on track to deploy in 15 to 20 markets this year. Which sounds an awful lot like a comment. Nancy’s analysis shows that some markets may get plain old UMTS (200 to 300 Kbps) and others HSDPA (400 to 700 Kbps). The company will offer the UMTS-skipping high-speed cell data in March in four countries: Cingular has decided to skip UMTS in the states in favor of HSDPA, and Deutsche Telekom’s T-Mobile International has opted for the same path. UMTS costs too much without delivering enough benefits during its short window of being the highest speed GSM migration path broadband offering. Novatel has two models, one for North America, and one for the rest of the world: The HSDPA (high-speed downlink packet access) standard is rapidly emerging as the GPRS/EDGE migration path with Cingular choosing to skip the W-CDMA flavor of UMTS that AT&T Wireless had trialed before their purchase. HSDPA leapfrogs W-CDMA speeds, which is why it’s so appealing. Novatel’s cards can be embedded in laptops which use PCI Express Mini as a way to incorporate standard networking components on the laptop’s bus. 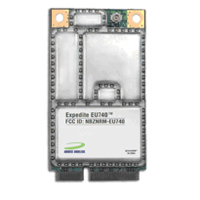 The cards are compatible with GSM, GPRS, and EDGE worldwide.